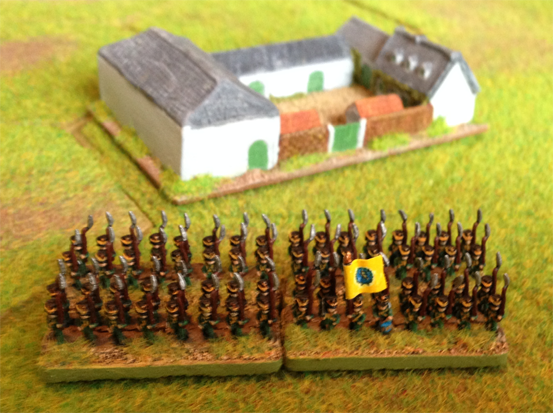 A quick guide to how I painted my 6mm Nassau Infantry using Baccus French Line Infantry (NFR1). Paint the undercoat in black and let dry completly. Paint the jacket and trousers green. Apply the paint by drybrushing using a Citadel Medium Drybrush. Use a stiff paint mixture on the drybrush wiping off any extra on a cloth before use. Run the brush along the surface of the figures, leaving paint on the raised areas, but allowing the black undercoat to show through. It doesn't matter if you even cover other areas such as face, musket or knapsack. Repeat the above drybrushing using the lighter green shade. Paint the hair, the musket and the knapsack. It doesn’t matter if you paint the hair too wide and cover part of the shako. Cords and Tassels on the shako and the Cross-belts. Use the following flag. Print it 6mm high on a laser printer. The staff should be brown. Cut away the Eagle so that it looks like a spear point and paint it gold. The drum should be yellow with mid blue rims.